There are many ways to stay organized. Today I am going to tell you 5 easy ways that I stay organized on a daily basis. Do not feel overwhelmed by this list. I am a wee bit OCD after all! 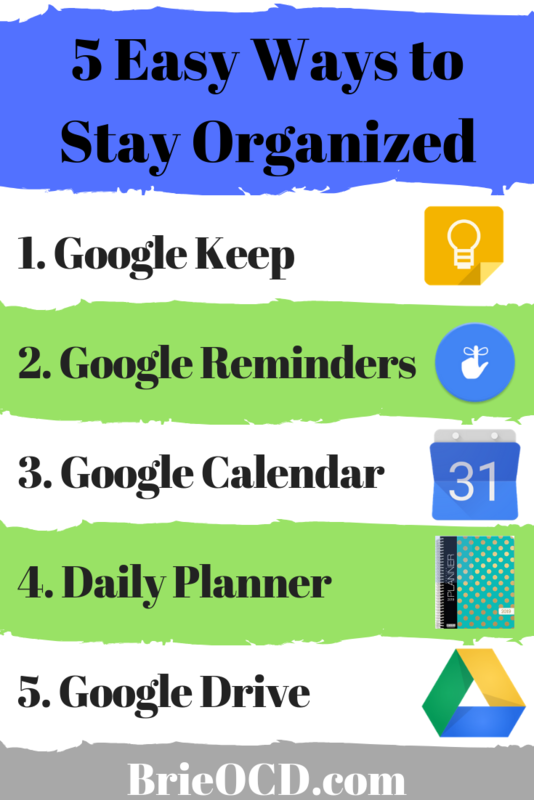 Even if you utilize 1 of the 5 ways, I am sure you will be more organized and less forgetful almost immediately! You can also view my YouTube video for visuals and live demo by scrolling down or by Clicking Here! Google Keep is my favorite list maker of all time. I have no less than 50 lists currently running. They range from grocery lists to blog ideas to must see movies to wine that I loved. There are so many cool features to Google Keep! Here are a few! ability to move the lists around so you keep them arranged how you want to see them. pin your most important lists to the top of the page. set a reminder for a particular list so that it pops up exactly when you need it. take pictures and add it to your list! email entire lists to people or to yourself! This app is the ultimate list and to-do keeper to help you stay organized. See YouTube Video below for how to use this app. I use google reminders every single day! You literally talk into the google search bar and say “Remind me today at 2pm to take the dogs out”, “Remind me in two weeks to check on my refund”, “Remind me on October 31st to wish my dad a Happy Birthday”. Sky is the limit! For whatever date and time you set the reminder you will get a notification telling you do something! It is AMAZING. My most used reminder is, “Remind me in one hour to check the laundry”. You can even set reminders on repeat to remind of you the same thing daily. ex. “Remind me to take my pills everyday at 9am”. To view/edit the list of reminders you have previously set, you simply say “View Reminders” into the google search bar. Try it!! See YouTube Video below for how to use this app. I use Google Calendar for all the birthdays, events, meetings, and places I need to go. I use it for the big picture of where I need to be on any given day. If you input an address into the calendar, you can easily navigate to where you need to be. You can also share your google calendar with others (ex family members) so that you can all be up to date on where the family needs to be (ex Joey has a soccer game at 4pm). See YouTube Video below for how to use this app. 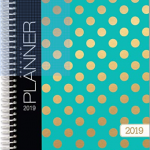 I use my daily planner for all the mundane details of life. I am old school and I still love to see things in writing. I use my daily planner for just that. The day to day tasks that need to be accomplished. Ex. Call AT&T, Follow up with Josie, Write Tuesday’s Blog yadda yadda. I also write in doctor’s appointments, birthdays etc. I love having a hard copy calendar with me to jot down any notes. Click here to view/buy the one I used this past year! Get rid of the filing cabinet and get google drive! This is the online place that I store all of my paperwork. Insurance policies, usernames and passwords, photos, you name it. You can easily share entire folders, or even just one document with others without clogging up their inbox. If you have a gmail email account you can easily insert a link to anything in stored in your drive account and send to someone. Google Drive is the ultimate filing cabinet and is accessible anywhere that you are! Just be sure that if you are storing any confidential information in your google drive that you enable two factor authentication on your gmail account (which you should do anyway!). Click here for how to do so. See YouTube Video below for how to use this app. Do not be stressed by all of these ways to stay organized. Instead, try one today and see how your life improves. Little by little start to implement another strategy into your daily routine. I am telling you, I wouldn’t remember anything that I had to do if I didn’t write it down. These lists and storage tools make life easier and memorable. I promise you that all of these tools will help you stay organized at work, at home and in life!